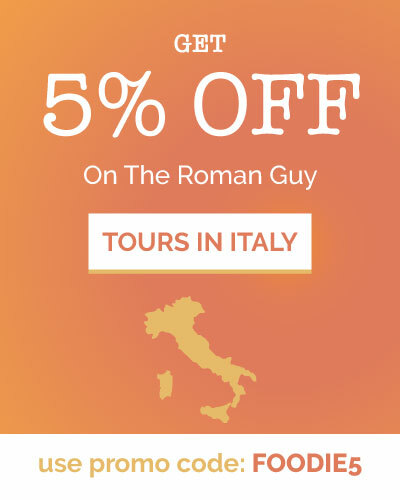 You might ask yourself, in a city as ancient as Rome, full of history and traditions, how can you possibly narrow down the best Roman dishes to only 5? Italian food is quite simple in the sense that you only need a few ingredients to make fabulous Roman Food. Because of this, the selection of traditional and best dishes in Rome isn’t as vast and overwhelming as you might think and can easily be narrowed down to 5 must-try dishes. Animella is an exquisite brother dish to coda alla vaccinara, or oxtail, and most definitely a top 5 as far as Roman cuisine is concerned. Animella, or sweetbreads as we call it in English, dates back to the 16th century and it is a dish that is prepared with bovine or ovine interiors, namely the pancreas and the saliva glands. It can be prepared in many ways: dipped in flour and fried in butter, stewed in sauce, or roasted at a high temperature, to name a few. 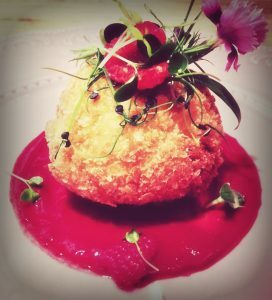 At Misticanza, chef Ermanno Nicolella revisits this dish by frying the animella. He then serves it with a raspberry reduction and oyster sauce. This new take on a traditional Roman Food is sure to blow you away! Cacio e pepe is one of the oldest and most traditional pasta dishes in Roman cuisine. The name literally translates to cheese and pepper and those are the only two ingredients added to the pasta in this recipe. Traditionally, cacio e pepe is prepared with tonarelli or vermicelli pasta which is boiled in water until it’s al dente. Then, leave a bit of the water in the pot that the pasta was cooked in. Add pecorino romano cheese and pepper, and then mix them together with the pasta. The starch in the pasta water fuses the cheese and pepper to the pasta, while the heat melts it all together. At Misticanza, they put a new spin on this traditional recipe by making the cacio e pepe into a risotto. Chef Nicolella uses carnaroli rice for this dish and dresses the traditional sauce with sichuan pepper (a spice primarily used in the orient) instead of the usual black pepper. 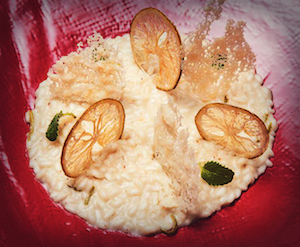 For the finishing touch, the risotto’s topped off with a garnish of candied lime and pecorino chips. The new take on the classic cheese and pepper pasta recipe, however, makes for a delicacy that is divine. Roman Food can be simple. from the pig’s cheek). The guanciale is cut into small pieces and cooked to crispy perfection separately in olive oil before combining it with the egg sauce. The egg mixture is added to the pasta in a serving dish avoiding heat which causes the eggs to coagulate. 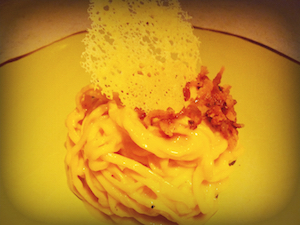 At Misticanza they stay pretty true to tradition in the preparation of this dish. With the exception of little tweaks such as using only organic eggs and guanciale from Monte San Biagio. A real classic Roman Food. 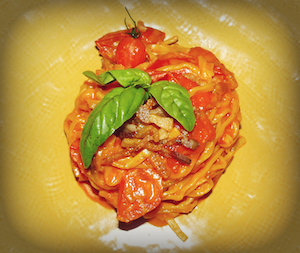 Pasta all’amatriciana, or as the Romans call it, la matriciana, is the evolution of pasta alla gricia. Gricia’s a pasta dish made with guanciale, pecorino romano, and olive oil. Invented in the late 18th century, tomato sauce began to incorporate into to the recipe; thus, a whole new dish, la matriciana, was born. Instead of tomato sauce, Misticanza prepares the matriciana made to order with fresh cherry tomatoes and guanciale from Amatrice. Of all the dishes on this list, this is the one that absolutely knocks my socks off every time. It is definitely the one not to miss if you have to choose just one to try. The agnello or as it is sometimes known, abbacchio, is a roasted suckling lamb dish typical of the Roman Food that can be traced all the way back to ancient times. 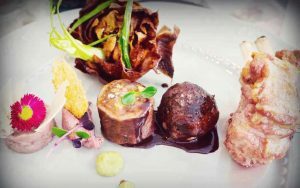 Chef Nicolella takes the the simple roasted lamb dish and raises it to a whole new level by providing several different samplings all on one plate. First there is an agnello tartar with honey and pecorino romano cheese. Next, an agnello patê, followed by an agnello roll with pine nuts and raisins. It doesn’t stop there either. There is also agnello in a delicate chocolate sauce and an agnello tartlet with mint sauce, crispy artichokes and fava beans. Each preparation is very unique and incredibly flavorful. Every region of Italy boasts its own culinary delights and Rome is no exception. If you are lucky enough to have the opportunity to visit the Eternal City, I highly recommend Misticanza as one of your food destinations in order to sample some of the wonderful food Rome has to offer. Stop by and visit the Settimi sisters and they’ll be happy not only to help you choose the perfect dish for your meal, but also to suggest a great wine that will compliment your order. Happy eating! 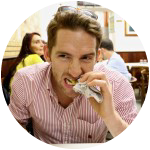 Come and eat your way through Rome with The Roman Foodie! Try many of these local Roman Food on our Rome Food Tour and share your pictures on Instagram, Facebook & Twitter #FoodPorn #TheRomanFoodie. Fancy seeing more of Rome? Have a look at our brother The Roman Guy for cool underground Colosseum tours and early entrance Vatican experiences!